Almost everyone and their mothers own some sort of leather jacket. Of course, we agree that this outerwear style is a wardrobe staple worth investing in, but when it comes to truly wanting to make a statement, painted leather jackets are where it's at. Unfortunately, painted leather jackets aren't easy to come by. Luckily for you, we've rounded up the best painted leather jackets on the market for your shopping pleasure. Since most of these bad boys are hand-painted, the prices range a little higher than your average leather moto. Needless to say, when you see the plethora of out-of-this-world designs and festive coloring, we have a feeling you'll be slightly more inclined to splurge. 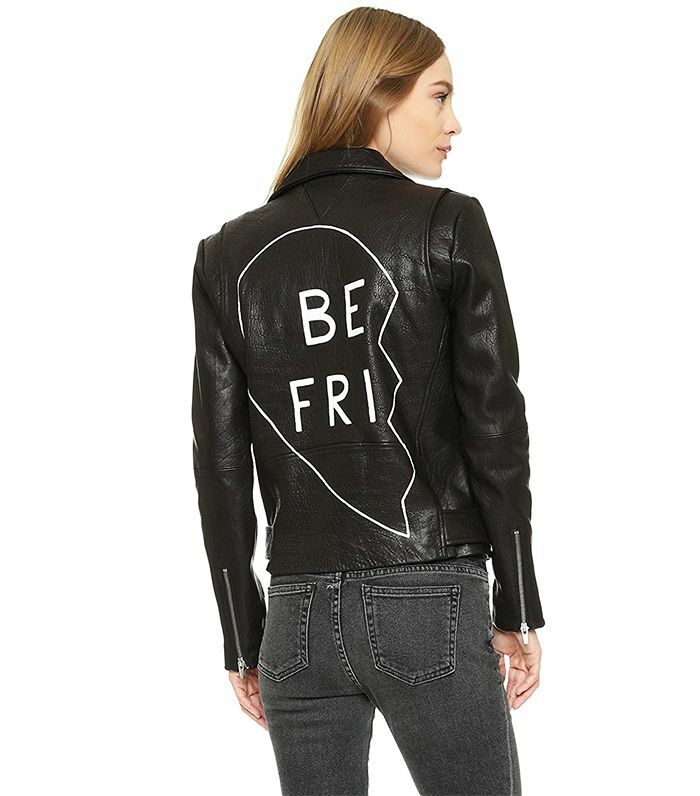 Go on to shop the best painted leather jackets on the market. …and one for your bestie. Can we be as cool as her? Thanks. There's no way you'll get lost in a crowd wearing this bad boy. And suddenly, every other plain leather jacket seems so boring. This one's for all the hopeless romantics out there. Because everything looks better covered in gold. Please note the cool sleeve zipper detailing on this beauty. Neon signs are trending after all. A hoodie has never looked better. This one even comes with a matching skirt. Sold. Everyone will be complimenting you on this floral frenzy. Next up, find out the coolest way to wear ankle boots with jeans this fall.